So good to be 'home' with my Papi! We had such a beautiful first day with the group, dreaming Teo through the eyes of the Healer. We started our day with Madre Sarita's practice of communing with the elements, praying with them and using the energy of the Sun to bless and purify water as a 'balsam of healing for humanity'. Atetelco - the temple of the Healers, then Tetitla where we dreamed in the dual awareness of light and matter, then we were delivered from the Pyramid of the Sun and down through the plazas of the Ether, Fire, Air, Water, and Earth. The group is dreaming at such a high level and it is such a pleasure! Everyone said they felt like they had the complete Teo experience in one day. Ha! And we still have five more days ahead. What a gift! Can't wait to see what happens today!!! Aaah Tepantitla, home of the Tree of Life and the temple of Tlaloc - the rain god of Teotihuacan. We dreamt with the soul of life that connects us all and dove into its healing waters, clearing our emotional bodies into a reflecting pool of intuition. So beautiful. We all were swaying in unison upon the river of life. Jaime and I called in a much needed rain for Teo and, as blessings have it, it promptly arrived last night with rumbles of thunder and flashes of lightning. Sarita used to say, "the elements are more obedient than we are." How right she was! Hahaha! Quetzalcoatl showed us the playground that is our mind. The guardian stone of the Moon invoked Sarita's prayers from us all which came seemingly as a song of rounds with Jaime showering us with healing water. The full moon smiled upon our Mitote ceremony, shining brightly over our fire with a huuuge circle of light around it which seemed to hold us in her womb. We all sang and danced and played like children around the fire until 3am (the witching hour), when we all surrendered to our sleepy bodies and to the dreams awaiting us in our beds. And finally, the Pyramid of the Moon where the Mother set us free from our selfishness and into the grace of true service. So many gifts and many more to come! I just love sharing these old tools with folks and watching them discover or rediscover themselves as a healer. There is something about connecting to an ancient lineage that empowers our work... like the centuries of practice hold a living memory that we step into. And of course the ancestors are so happy to lend their support. Where students may at first be intimidated by an Egg Cleansing, they inevitably slip into a familiar flow... especially when they trust it and their doubt recedes into faith. We had such an exquisite journey up the pyramid of the Sun yesterday, preparing ourselves with a visit to the Temple of the Masters and the Palace of the Butterflies. We also stopped by the place of the Elders where we received a beautiful message of how to ascend the pyramid - as an offering rather than an asking. And the group surrendered so sweetly into this message, becoming walking prayers for humanity with each step, each breath. Like I said, this group is dreaming at such a high level and it was apparent to all who joined us in our ceremony at the top. We had Mothers asking for healings, a little girl requesting a blessing for her obsidian turtle, and a lovely man named Gustavo who joined our meditation and even flew to the Sun with us. So sweet and lovely. Truly I feel so honored to be in service to such amazing and generous healers - all so willing to give of themselves, and they each have been gifted with the truth of giving - that the more we give the more we are. Today, we returned to Tetitla, the Palace of the Eagles, and were given two hours in complete privacy in which each received Sarita's ceremony of initiation, being given the energy of protection for their work and a Spirit Guide to journey with them, teaching them through their dreams and guiding them in their healing work. Gifts upon gifts, this journey. Tonight, we fiesta and learn the sacred dance of twerking (thanks to one of our participants). Ha! See, we take our spirituality verrry seriously. Let's see just how us Shamans can twerk it. Though I personally may have to call upon my Spirit Guide for assistance. Hahaha! Suenos azul - Blue dreams. Though I of course played with this image, it truly represents the bluish purple light that radiated throughout our journey. 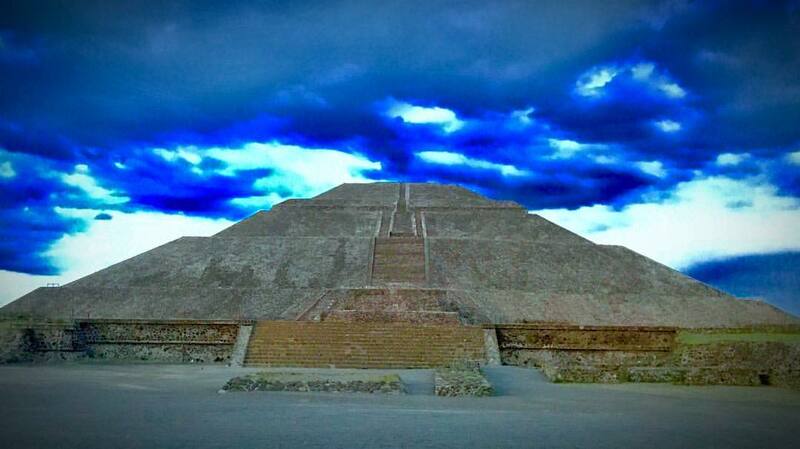 It is the light of healing and it accompanied us at every temple in Teotihuacan. Madre Sarita used to call in this light to perform her healings. So beautiful and so strong in its presence. Today our group is homeward bound, traveling to each of our places to now spread this light to all those in need. Though it is sad to part, we are forever connected as a tribe of healers and will continue to grow as new healers find their place with us. Gracias infinitas to Madre Sarita for bringing this lineage to the states so many years ago. The courage and faith that it took for her leave her home have been paid forward to so many who are now working in verdad, in truth - without the fears of superstition nor the crown of ego.